As Minneapolis considers dropping parking minimums for residential developments near transit, Seattle may soon be talking about doing away with driveways for single-family houses. “The new designation, even if it’s limited to a pilot project, as the draft suggests, would be a stunning rebuke to the supposed sanctity of single-family zoning, which applies to an astonishing 65 percent of all the land in Seattle,” says Barnett. That’s not all. 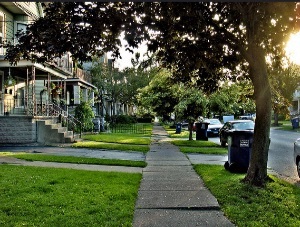 The draft questions the necessity of a parking spot for every single-family home. Requiring one off-street parking space for every single family home is an artifact of an earlier era and is not a necessary or effective requirement. The space occupied by an off-street garage or parking space could be used instead to accommodate space for housing, including an accessory dwelling unit. The most common parking configuration — a driveway and curb cut accessing a garage from the street — occupies curb space that could be used to provide a parking space on the street. A 1:1 parking requirement eliminates exactly as many on-street spaces as it mandates off the street, causing no increase in parking supply, bisecting sidewalks with countless driveways, and gobbling buildable housing space for redundant (and expensive) parking. Therefore, the City should consider removing the parking requirement for single family homes. Barnett says the draft may be altered before the committee signs off on it, but “could be a game changer” if it emerges as is. No kidding. Elsewhere on the Network today: Mobilizing the Region rethinks commuter rail service in the Tri-State area, Greater Greater Washington says a kid-friendly city is a human-friendly city, and Where the Sidewalk Starts examines how European cities make streets safer by putting pedestrians first.